While Pusarla Venkata Sindhu was aiming to earn a gold for her country in the Rio Olympics, back home thousands of kilometres away many were, shockingly, fighting to stake claim over her. Even as she gave her best and tried to outrun two-time world champion Carolina Marin of Spain, netizens were busy searching for her caste-identity on Google. First pointed out by one Vivekanand Nagarajan on his Facebook wall, and later verified by Google Trends statistics, the data suggests that many Indians were more curious about "pv Sindhu caste" over the last week than they have been about her live match scores. When one typed 'pv' on Google search, the suggestions that came up automatically were pv sindhu, pv sindhu match, pv sindhu wiki and pv sindhu caste. Most of the searches were made from Vijaywada (Andhra Pradesh), Secundarabad (Telangana), Vishakapatnam (Andhra Pradesh) and Hyderabad. Coach Pullela Gopichand's wasn't spared as well. Many sought to know his caste credentials as well. National newspaper The Hindu, on Saturday, reported that while Andhra Pradesh claimed Sindhu was their ‘ammayi’ or daughter, Telangana residents branded her as their “bidda” with some even posting images of the player carrying the traditional Bonam at the recent Bonalu festival in Hyderabad to justify their claim. The paper went on to say that people looked up her caste also because her parents had a love marriage, a situation where caste differences are often ignored. Sindhu was born and brought up in Hyderabad but her mother belongs to Vijayawada. After her match, the Andhra Pradesh government announced a slew of rewards, including a cash award of Rs 3 crore. "We will give her 1,000 sq yds of house site in the state's new capital Amaravati and also a Group-1 officer post in the state government. She can choose the post she wants," Chief Minister N Chandrababu Naidu announced. Not to be outdone, the Telangana government announced a cash reward of Rs 5 crore. "There is a need to encourage sports personalities. 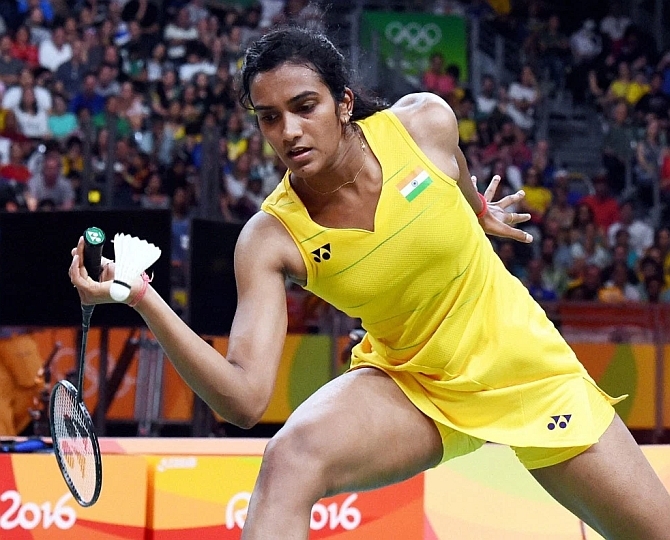 Like Sania Mirza, who brought laurels by winning several tournaments after encouragement by the government, we hope Sindhu will also bring many laurels by winning many more tournaments in the future. She is coming to Hyderabad on August 22. The Cabinet has decided to accord her a grand reception," Telangana Chief Minister K Chandrasekhar Rao told reporters. However, Sindhu's parents had the final word on the matter. Seeking to lay the matter to rest, Sindhu's mother Vijayalakshmi said her girl is an Indian first. "Let us all enjoy this moment of triumph and look forward to a golden finish and not engage in a debate," she said.